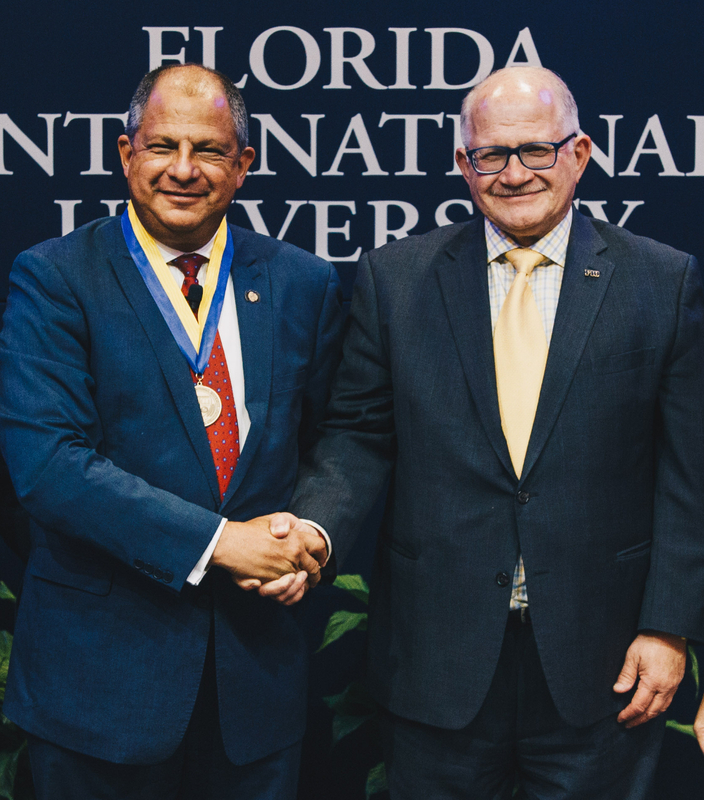 Former Costa Rican President Luis Guillermo Solís Rivera has been named a distinguished visiting professor at FIU’s Kimberly Green Latin American and Caribbean Center (LACC), shortly after turning over the reins of the country he led for the past four years. The move is a kind of homecoming for Solís, who served as a researcher with LACC and also worked with FIU’s Center for the Administration of Justice. LACC and the Center for the Administration of Justice are both part of the Steven J. Green School of International and Public Affairs, which just received a top ten ranking in U.S. News and World Report for its program in international and global policy. Last year, during a visit to FIU, Rosenberg presented Solís with the Presidential Gold Medallion – the highest honor the university bestows upon heads of state and other high-ranking public officials. As a visiting professor beginning this fall, Solís will lecture on governance and democratic sustainability in Latin America and the Caribbean, among other topics, said Frank O. Mora, director of LACC. His appointment is for one year. “We are very fortunate to have the quintessential scholar-practitioner in President Solís to engage our faculty, students and the broader community on the central policy and academic debates facing the Americas,” Mora said. Before he was elected Costa Rica’s 47th president in 2014, Solís held numerous diplomatic positions, including ambassador for Central American affairs and director general for foreign policy. He is known as a strong advocate for sustainable development and worked with numerous philanthropic and multilateral organizations, including the Foundation for Peace and Democracy, the Arias Foundation Peace and Reconciliation Center and the Academic Council for the United Nations System, a global association that encourages international cooperation. Solís’ lengthy academic career includes nearly 30 years at the University of Costa Rica, where he held various positions, including a deanship, and he remains a tenured professor of history and political science. He has written, co-written or edited 10 books and published more than 60 academic articles. Solís holds a bachelor’s degree in history from the University of Costa Rica and a master’s degree in Latin American studies from Tulane University in New Orleans. It is an excellent academic choice for us. He will comment and teach socio-political and economic subjects on Costa Rica and many others Latin American countries adding his great personal experience.